Technological advancements dictate the productivity growth in all industries, including extractive ones. In the peculiar case of metallic mineral industries, this growth is also impacted by the natural variation in the metal content and chemical composition of the ore input, in the course of cumulative extraction and depletion of resources. Through a disaggregated treatment of productivity data achieved by using the input-output data on subprocesses of copper production and correlating them with input characteristics (ore grade), this study identifies and evaluates the impacts of the periodic changes in the natural input, as well as those of the technological progress, while reasonably controlling the influence of the other unrelated factors. This provides an objective assessment of the manner and extent of mitigation of the impact of the depletion-driven changes in the natural inputs of the said industry, through technological advancements. It reveals that the continuous and incremental developments in technology, successfully offset the detrimental effects of depletion on the copper sector productivity, often aided by the geological characteristics that changed to the miners’ advantage. However, the impact of depletion stands to outweigh the gains from innovative technologies, as soon as the ores breach a minimum threshold level of purity or chemistry. This study thus establishes the usefulness of productivity studies in estimating the impacts of depletion that may not proceed in strictly sequential and uni-directional manner. More importantly, it shows that the impacts are neither uniform nor linear and are not always detrimental to productivity growth. Though the study is primarily based on copper industry, the findings hold relevance for other metal industries too. “Our entire society rests upon—and is dependent upon—our water, our land, our forests and our minerals. How we use these resources influences our health, society, economy and well-being” (Kennedy 1961). Continued availability of minerals, which are essentially non-renewable, heterogeneous, and finite natural sources of various elements, is important to sustain industrial growth, and in turn, socio-economic welfare. Malthus first propounded that as these finite stocks are irreversibly depleted, industry will eventually face a physical scarcity of natural resources (Malthus 1798) that will put a stop to its continued growth. This hypothesis of absolute scarcity implicitly assumes constant resource productivity with no technical change from the then known levels. Mill, however, envisaged that faced with this threat of scarcity, society will find ways to counter it through human ingenuity (Mill 1848). Since the resources vary in quality and characteristics, an inter-temporally profit-maximizing firm will “sequentially” exploit the easiest and richest ones first, between the known “stock” at any given point of time, subject to accessibility (Cook 1996). Hence, with depletion, “greater efforts” will be required to exploit the next available ore deposits (Skinner 1987), which may be inferior in quality. Thus, sector productivity will fall, ceteris paribus, over time (Ricardo 1821), causing the “cost of extraction of minerals to rise enough to choke off demand much before we run out of physical stock” (Tilton 2003). Productivity growth of a given mineral sector will therefore carry the embedded impact of this phenomenon of “economic depletion,” independent of its physical availability. In fact, physical availability is predicted to increase, as with grade (metal content) falling arithmetically, the volume of the resource base is set to expand geometrically (Lasky 1950). However, the validity of this postulate was questioned later (De Young 1981). Modern theorists (Devrajan and Fisher 1981), having combined the issue of extraction cost rising with cumulative production clarified that the value of stock will rise at “market rate of interest less percentage increase in cost,” ceteris paribus. This increase in the value of the stock, apparently driven by scarcity, reflects “scarcity rent” and gives rise to the relative scarcity hypothesis. Scarcity thus generates a surplus (or capital) that may be invested to explore and replace the depleted resources (Solow 1974), prompting mines with longer reserve life to take a long-term view and invest for future benefits (Tilton 2001). Innovations through new process developments often yield the largest gains (in productivity) that mostly benefit the first movers in the industry (Kulshrestha and Parikh 2002). In this study, a productivity-based approach is undertaken to estimate the economic impacts acknowledging that studies based on economic indicators, primarily market price, have not so far revealed unequivocal support for either economic depletion or the aforesaid hypotheses on “relative” and “absolute” scarcity (Tilton 2003). Solow2 (1957) introduced an easily computable index (Solow Residual), which may be interpreted as a measure of “technical change” that is defined as the change in output not explained by the change in a combined indexed value of all inputs.3 This is reflected in total factor productivity (TFP)4 that through the “Solow Residual,” measures the unaccounted for influences or factors of input in the process, including improvements in the performance of individual factors of production, from the effects of changes in factor quantities. Modern authors (Lasserre and Ouellette 1988) prefer calculating TFP using indices instead of actual values of inputs and outputs. This is often referred to as the “Divisia-Index”-based method. Divisia index is a weighted sum of growth rates of various components of TFP, where the weights are the respective component’s share in the total value of inputs. In such case, by defining technical change as the change in output not explained by the change in an index of all inputs, it is plausible to isolate the contribution of technological improvements, including improvements in the performance of individual factors of production, from the effects of changes in factor quantities. However, the application and usage of this Solow Residual to extractive industries needs to be qualified, since with increasing resource depletion, less output is produced for given inputs, or alternatively, more input is necessary to extract a given quantity of mineral (Rodriguez and Arias 2008).5 Thus, in the particular case of the extractive sectors, rising difficulty levels and degradation of resource input will cause productivity to decline, ceteris paribus, as the intensity of other inputs rise to compensate, within a given technological regime. Hence, the impact of a non-traditional “lurking variable” (Topp et al. 2008) representing change in ore input quality, in the form of suitable ore characteristics, has to be accounted for (Topp et al. 2008), while measuring productivity growth in extractive sectors and comparing it with that in non-extractive ones. The impact of changes in ore quality can be ascertained through the selection of appropriate input characteristic as a proxy for depletion. The preeminent economic importance of “grade,” to serve as the principal proxy for depletion effects in metallic minerals, was conclusively demonstrated through a case study (Lasserre and Ouellette 1988) of the Canadian mining industry. This study compared the issues arising in measurements of TFP in extractive industries, wherein the natural inputs may vary over time and with depletion, and compared the results with the non-extractive sector, which is not subject to such change. It clarified that grade changes have the most noticeable impact on productivity in all such cases, especially for copper, gold, silver, nickel, and iron, where resource input holds a relatively higher share in input costs, in comparison with the case of asbestos, where the resource input is of such low value compared with the rest of the inputs that the resource is treated as free. Grade is also mentioned as an important determinant of production cost in engineering literature (Wedge 1973). Thus, productivity measurement may be applied to quantify—in a systematic and consistent way—the proximate sources of growth, duly complemented by institutional, historical and case studies, in order to explore some of the underlying causes of productivity change (OECD n.d.), for example, innovation. Despite its limitations, the productivity analysis enables one to distinguish and estimate the contribution of technical change in preventing a significant rise in resource scarcity (Lasserre and Ouellette 1988), with reasonable data and information on the subject. Therefore, the quantum of detrimental impacts of depletion on productivity, especially on energy intensity and metal recovery, will be isolated and estimated using ore grade as a proxy for depletion, within an index-linked6 and KLEMS7-based TFP study that acknowledges the role of such inputs (OECD n.d.). Apart from this, the other major impact on productivity will arise from beneficial progress in technology. The analytical methodologies in the subsequent case studies are structured accordingly. Since the changes in the ore characteristics with cumulative extraction depend primarily on the types of deposits of a metal and the volumes of known and accessible resources of each type, it is apparent that “scarce” metals with bi-modal distribution, such as copper, will face the common changes sooner than the “abundant” ones8 with uni-modal occurrence. Copper often occurs in unique porphyry type deposits, as found in the USA, having both rich sulfides and lower grade of oxide ores in the same deposit. The rich sulfide ores are preferred as they consume lesser energy and generate a higher yield than the lower grade of ores including the oxides. With cumulative extraction, as grade falls below a threshold9 level, energy consumptions in beneficiation and refining go up while metal recovery falls. Among the technological changes introduced in the US copper industry, the contribution of an innovative technique, solvent extraction electro-winning (SXEW), was highlighted (OTA 1988) for dramatically improving productivity (Tilton and Landsberg 1999), along with the contribution of change in method of mining from underground to opencast (Kulshrestha and Parikh 2002). The technological transition ensuing with depletion may be segregated for copper, into three stages for ease and clarity in analyzing the resultant changes in productivity. In the first stage, rich sulfide ore was treated by traditional pyrometallurgy, which is referred to as the old regime or constant technology. Next, with poorer sulfides being mined, various incremental improvements took place within the “old regime” to reduce energy intensity and add flexibility in treating the lower-grade ores. This is a subphase of “improvements” within the pyrometallurgical route. Thereafter, low-grade sulfides as well as co-mined oxide ores of the porphyry deposits and previously dumped out oxide-based tailings of pyrometallurgy are utilized in a “combined regime.” Both pyrometallurgical route and the new leaching-and-SXEW technique are applied to recover as much of metal units as possible from all the aforesaid resources, to compensate for the falling yield. This marks the beginning of a phase of increasingly high productivity. Lastly, industry moves into a “new regime” when only the leaching-and-SXEW is applied on freshly mined oxide ores, as sulfide ores are completely exhausted. Following technological improvements, OTA (1988) reported that labor productivity (LP) had improved as “employee hours per ton” of copper metal produced fell from 46 to 20 in milling (including mining) stage, and from 22 to 17 in smelting and refining, during the period 1973 to 1986. Also, net operating cost dropped from a range of US Cents 80–90 to 54 per pound, during the period 1981–1986. OTA attributed these positive economic changes in labor productivity and cost, to an increase in productivity from technological improvements, closure of high-cost facilities, and other positive actions. In 1977, the US copper industry’s energy requirement reached about 85 million Btu/ton of metal produced, vis-à-vis about 15 million Btu/ton for steel, 24 million Btu/ton for lead, and 64 million Btu/ton for zinc. The rise in energy consumption was a major concern for all stakeholders of the industry, and therefore became a focus area of the OTA study (OTA 1988). The USA, being in the forefront of industrialization, occupied a pre-eminent position in world copper industry producing nearly 19–21% of global production and also kept exporting consistently until 1975–1976 (Table 1). This position however, came under threat as the production cost went up in the US plants, following deterioration in copper ore grade. This coincided with general downtrend in global price, especially in the period 1977–1987, and entry of new producers, such as Chileans, with much better ore grades (OTA 1988). It is apparent from the data (Table 1) that the USA’s exports fell sharply from 1977 onwards, while imports went up during the period 1977–1987. 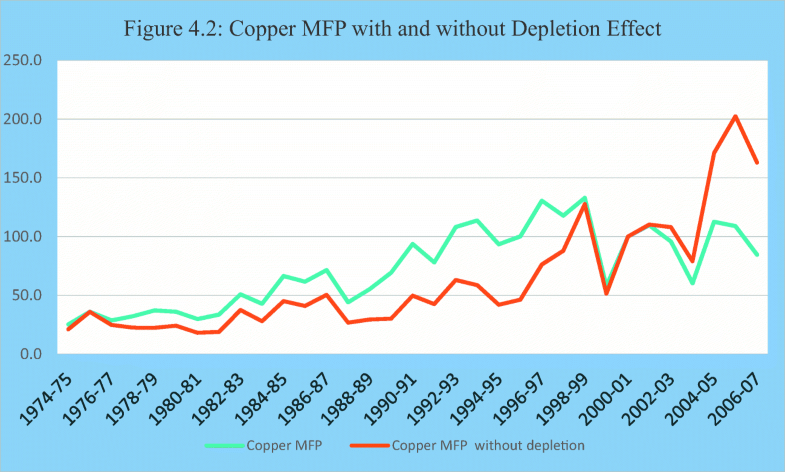 With the introduction of new technology that reduced cost of production in the USA (OTA 1988), and coincidental recovery in global prices from 1986 onwards, the US copper industry partially regained its lost glory, albeit for a limited period. It was estimated that while technological offsets pertaining to continuous and incremental improvements usually deliver single digit increases in productivity, the step-change innovation of SXEW process in the US copper industry in this period, made nearly 20% improvement in productivity (Garcia et al. 2001). Notable previous studies (Tilton and Landsberg 1999; OTA 1988) on the US copper industry had primarily noted the aggregate benefits from SXEW as productivity improved owing to the additional metal recovery from wastes that came as “free inputs” without the costs of mining and beneficiation. The present assessment evaluates the impact of the new technology on copper sector productivity, through the changes in energy consumption and metal recovery. Those are the most adversely affected parameters due to ore transition.10 This study compares productivity changes under both the old and new technological regimes.11 The changes in energy intensity and metal recovery are crucial to this study because: (a) they maintain distinct and unidirectional, though non-linear, relation with grade, (b) grade-driven changes in these two key process parameters eventually impact productivity, and (c) the changes in these two parameters are well recorded vis-à-vis grade values. Analysis of these changes, in turn, helps one to estimate the economic impact of SXEW when freshly mined oxide ores are used, as sulfides deplete and process ore input completely shifts to the new types. Table 2 has been prepared on the basis of the input-output data collated from OTA (1988) report to quantify the impacts of grade and technology on input energy intensity and yield (often referred to as metal recovery). Data not reported by OTA. Should be the same as row 3 as no technological change occurred. aDifference between columns 6 and 5, etc. It is observed here in part A of Table 2 that energy intensity rises at an increasing rate,12 while resource recovery diminishes at an increasing rate with fall in grade, so long as technology is constant. It is noted in part A (row 3) that recovery drops by 0.74 percentage points for 0.05 percentage point fall in grade from 0.7 to 0.65% but drops by 1.49 percentage points when grade falls from 0.50 to 0.45%. We further find that energy intensity, whether in pyrometallurgical regime (part A, row 4 of Table 2 and column C of Table 3) or in combined regime (column F of Table 3), goes up significantly (approximately two times) as the grade value goes below 0.50%. This, along with significantly larger drop in recovery (row 3, part A of Table 2), may lead to a dramatic fall in productivity upon breaching this grade value of 0.50%. With reference to the current pyrometallurgical process, this point is therefore taken as the “threshold grade” below which the said process becomes economically unviable, ceteris paribus. The impacts of incremental improvements that primarily focused on energy intensity and successfully reduced the same, are shown in part B (Table 2). The impact of these incremental improvements on metal recovery was not significant, but they indirectly augmented the resource base and overall recovery, by bringing the hitherto unusable lower sulfide grades into useful resource base. Thus, it succeeded in boosting productivity in the short term, through higher recovery. In part C (Table 2), it is demonstrated that in the “combined regime” of SXEW as complementary technology energy intensity in the refining step through SXEW route is considerably higher than that in sulfide feed refining. As compared with constant technology, SXEW requires nearly 2.5 times more energy, and almost five times vis-à-vis that with incremental improvements. Therefore, weighted average energy intensity for the entire process, drops marginally (row 8) implying that the energy-saving impact is insignificant in this combined regime. Productivity improvement is purely due to enhanced recovery from wastes. This would carry the net impact of the productivity gains of the successful producers, after setting off the losses suffered by the rest. As per this current study, the positive impact should be highest in the combined regime when output rises by nearly 33% with the introduction of SXEW. However, it is imperative to note the changes in all inputs need to be taken into account in order to be able to comment on the effective impact on the sector TFP. The contemporary BLS.us (n.d.) data show that L, K, and M,13 which respectively had 16, 21, and 63%, share of input cost, registered annual productivity changes as + 4.5, + 1.68, and (−) 3.78%. Therefore, the combined indexed change in inputs comes to (−) 1.308%. After allowing for productivity losses suffered by lagging producers and those who did not achieve desired efficiency in new practices (Asafu-Adijaye and Mahadevan 2003; Kissel 2000), the finding from this study supports the reported 20–24% improvement in productivity (TFP) following introduction of SXEW (Garcia et al. 2001; Tilton and Landsberg 1999). It is also reported (OTA 1988) that SXEW had low capital investment, labor cost and operating expenses; and it brought the cost of production (OTA 1988) of copper metal from old tailing dumps to US Cents 30 per pound in the USA, using “free input,” which did not consume any additional grinding energy either. The situation turns grossly adverse in the third period i.e. “new regime” when milling costs are added. The cost of production from SXEW then significantly outruns that of the “old regime,” ceteris paribus. Given the present records of geological and technological changes, the impacts of ore shift from sulfides to oxides in the case of scarce metals, such as copper and nickel, are likely to be economically significant and detrimental. While sulfide ores break in an exothermic reaction, the oxide ores go through an endothermic reaction to liberate metal units, which is inherently more energy intensive than the former. On the other hand, the hydrometallurgical processes, such as SXEW, merely recover about 33% of contained metal units from ores, as compared with about 86–89% in pyrometallurgical regime. Consequently, the ore volume to be mined goes up nearly 2.5 times for each ton of metal (final output). This rise in energy intensity far outweighs the energy savings from the mechanized large-scale mining of larger ore bodies of lower grades. Recovery rate therefore makes an important adverse impact in the new technology. For abundant metals, and rather generally for all oxide-based ores, such as iron ore, zinc ore, chrome ore, manganese ore, and bauxite, the position of this techno-economic threshold grade appears far from the presently exploited grade and a shift to a “new” regime may have a completely different impact on productivity vis-à-vis scarce metals. The value of the “threshold” depends primarily on the extraction technology, as well as on several intrinsic and extrinsic factors associated with a given metal. For metals occurring in poly-metallic deposits, such as zinc from silver–lead–zinc combination orebody, the “economic threshold” will also be guided by the economic contribution from other co-extracted metal units. Since productivities of the projects based on the “new hydro-metallurgical regime,” for example, SXEW or high-pressure acid leaching (HPAL) that operates on the same principle, are considerably lower than the old pyro-metallurgical ones that use sulfides, the projects set up with these new technologies may find it difficult to compete with the existing mills operating in old regimes14 often with better ores, and eventually depletion is likely to push the industry cost curve upwards when the new type of ore is exploited through similar new technology, ceteris paribus. The specific surge in productivity in copper was possible primarily due to the unique co-occurrence of sulfide and oxide ores in the porphyry copper deposits15 that allowed additional recovery from oxide waste and co-mined oxide ore. Since this co-occurrence is not known amongst other metallic ore deposits, notably not in case of nickel (Skinner 1976), the depletion effects are likely to surpass the gains of technology when the next type of resources is eventually exploited, unless such unique combination deposits are not found. Australia has the world’s second largest “economic demonstrated resources”16 of copper (13%) after Chile (28%), and ranked globally fifth in terms of production in 2014, after Chile, China, the USA, and Peru (ICSG 2015). 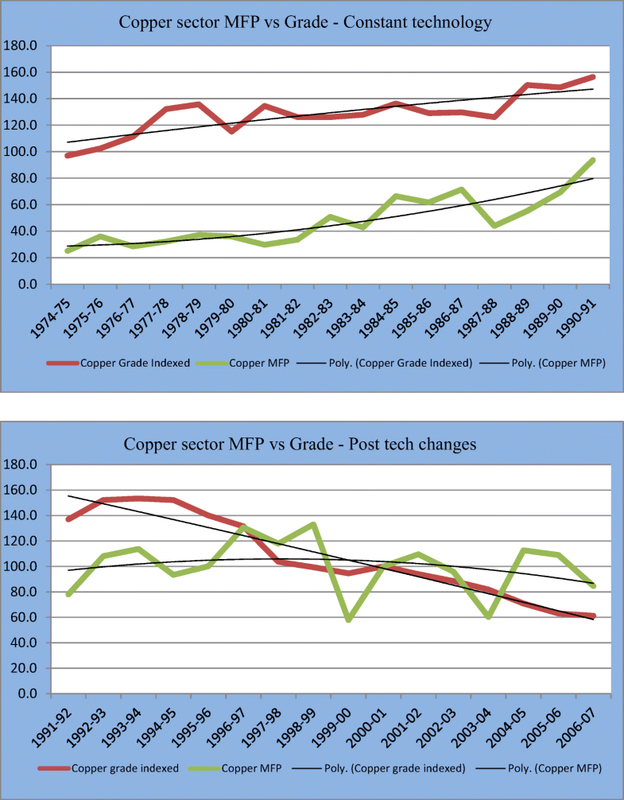 In this section, the productivity changes in the Australian copper sector will be analyzed, over a period of 33 years from 1974 to 1975 to 2006–2007, in absolute terms and also in comparison with other metals, in relation to depletion and technological changes over specific subperiods. Ore grade will be used as a proxy for depletion impacts. During this period of study (Table 4), Australian copper production increased nearly fourfold, from about 250,000 to about 900,000 tons/annum, while its share in world production doubled from 3 to 6%. At the end of this period, copper accounted for 5.2% of the total value of mining industry output of the country (Topp et al. 2008). Producers in this mineral-rich country consistently invested in expansions and technological up gradation of copper mines and plants, despite the gradual degradation in average ore quality towards the later part of this period. Several plants deployed best-in-class technology to counter the depletion impacts and the industry witnessed notable structural changes and improvement in productivity while ore grade went through periods of rise, stability, and fall (Fig. 1). To evaluate the performance of technology in mitigating the detrimental effects of depletion, the entire period of study is divided into two main subperiods, according to the trends in production and productivity (Tables 4 and 5; Fig. 1). The first phase (period 1), from 1974 to 1988 is marked by stagnant production from a large number of scattered and small producers, with no significant change in technology and scale of operation, and almost nil growth in productivity. The resource quality, especially in larger mines, actually improved during this period. On the other hand, the second phase (period 2), from 1989 to 2007 shows a remarkable increase in production, phenomenal growth in productivity despite a declining ore quality, and adoption of new technologies. These developments took place in a consolidated industry dominated by a small number of medium to large-size firms, with advantages of scale. According to the trend in productivity growth and stages of structural changes in the industry, the second phase is further divided into three smaller periods, namely 2A, 2B, and 2C. Period 2A is marked by early adoption of new technology and beginning of very large-scale mechanized mine operations led by the Olympic Dam project in the state of South Australia. The success immediately encouraged the rapid development of a new generation of very large mines based on newly discovered or available large ore bodies of low-grade ores, and high-output state-of-the-art furnaces in other states, such as Queensland and New South Wales, in period 2B. This was followed up by the consolidation in period 2C when many unviable smaller firms exited and those with better potential grew to medium to large-size units to reap the benefits of new technology and economies of scale. Infusion of capital in the second phase was considerably higher than that in the first phase, in tune with the then general trend in the mining industry. Figure 2 reveals that rising resource quality (ore grade) had a clear positive impact on copper section productivity from 1974 to 1975 to 1998–1999, as removal of “grade effect” (known here as depletion effect) actually pushes the MFP trend down. This positive role of resource input, over and above concurrent positive impacts of technological change, came to an end in the year 2002–2003, when Fig. 2 reveals that removal of “depletion effects” pushes the trend upwards. The key impact of technology lies in setting the MFP growth on a positive trend of increase, in contrast to the decline in grade. This impact is evident from the present data on Australian growth trend. In Fig. 3a, b, it is demonstrated that MFP-to-grade relationship underwent a significant reversal as grade fell noticeably with depletion and significant “incremental technological changes,” mainly in furnace designs (Mudd 2009). During the period 1974–1975 to 1990–1991, under nearly constant technology with few “continuous improvements,” MFP strongly followed grade with a correlation coefficient of + 0.698, signifying a strong dependency. As yield was guided by grade, the MFP to yield correlation also stood at + 0.753. However, a change in the relationship appeared from 1991 to 1992 onwards, as MFP moved upwards in direct contrast to the rapid decline in grade. The MFP to grade correlation coefficient for this period came to + 0.173 and the lines crossed each other, evidencing a reversal of the relationship. At this point of inflection, the positive impact of technology on MFP balanced off the then adverse impact of depletion. Leaving aside two seemingly perverse drops during mine developments in 1999–2000 and 2003–2004, the spectacular rise of MFP testifies to the success of technology. MFP without depletion and capital effects climbed from an indexed value of 30.3 in 1990–1991 to 190 in 2005–2006, coinciding with the steady rise in capital investment into large new projects and expansions. These projects came up to utilize large, low-grade ore bodies, which are amenable to high-volume mechanized mining at significantly lower cost per ton, as compared with the smaller or bodies with higher grade. Further, the geological certainty of huge in situ resources allowed them to build processing plants of larger capacity with state-of-the-art technology. In turn, these projects had the combined advantages of low cost of mining, deployment of latest technologies and high throughput. As grades fall, copper ore bodies usually come in larger volumes (Musgrove 1971). It is pertinent to mention that the Australian Productivity Council (APC, Topp et al. 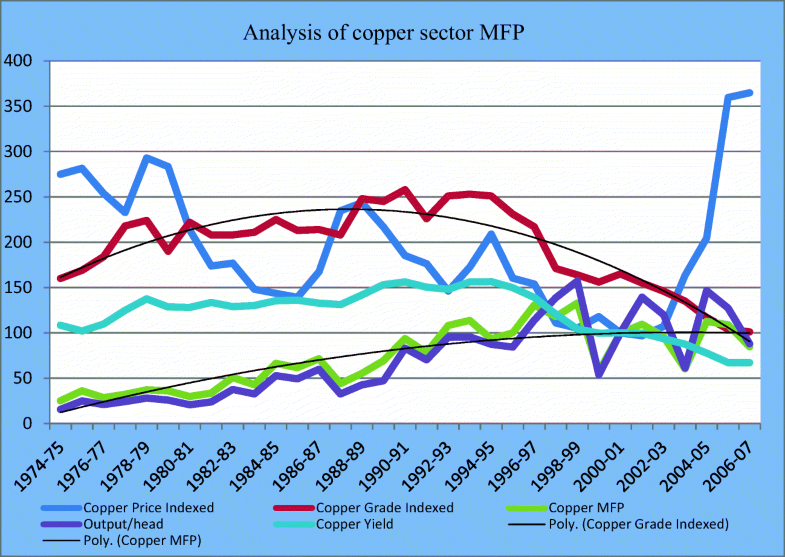 2008) has estimated, without specifically commenting on the intermittent drop due to developmental activity, that during the period 2000–2001 to 2006–2007, copper MFP suffered a net decline of 15.4 percentage points, of which depletion accounted for negative 78.4 percentage points while “other factors” including technology contributed positive 50.1 percentage points and effect of capital was positive 13 percentage points (Table 6). This, in comparison with other sectors, shows the highest positive contribution of “other factors” in copper industry, as well as the highest negative impact of depletion in it (Table 6). In contrast to the phenomenal rise in MFP representing impact of technology, MFP without depletion and capital effects) from 1990 to 1991 to 2006–2007, this observation by the APC shows a comparatively lesser offsetting of the depletion effects by the technological gains. However, the APC report also mentions that in general, all metal sectors showed lower growth in productivity during this period, particularly due to booming investment in response to high prices (Topp et al. 2008). The rising resource quality in the initial 22 years that boosted productivity appears to contradict the assumption of “sequential depletion” in classical theory on resource depletion (Hotelling 1931). It is pertinent to note that the validity of sequential exploitation has been questioned already earlier (Herfindahl 1967; Hartwick 1978; Hanson 1980; Drury 1982) and present observations lend support to those studies. However, the time-series data do show that eventually resource quality goes down with cumulative production, in line with the theoretical assumptions. It is also noticed that the grade values maintained an uptrend for the initial years in the larger mines, producing on an average 50,000 tons/annum, or above; while the grade values fluctuated within a narrower band for the mines of lesser production and showed a general trend of decline earlier than the former set.19 This phenomenon is caused by the larger and heterogeneous resource endowment of a high-capacity mine, which may have segments of high-purity ore.
For any given metal industry, the change in productivity trend will be generally guided by the chemical composition of the next available ores, their orebody characteristics and available technological options, and an improvement cannot be ruled out. Technological advancements in ore processing would typically move the “grade threshold” to lower levels of purity and allow increases in resource bases. Recycling, reduction in intensity-of-use and increasing use of substitutes may simultaneously ease the demand growth, thereby extending the resultant economic life of resources. Appropriate sets of logical conclusions are presented in the next section, based on the foregoing analyses of productivity trends in the copper industry under two different, yet complementary, circumstances of depletion and related technological changes, set in two different geological and socio-political domains. The foregoing inquiry into the manner and degree of the impacts of depletion in natural resource inputs and the effects of technological changes on the productivity growth of copper industry, were conducted in two different yet complementary types of depletion settings. The case studies were uniquely based on empirical industry data for process parameters under changing technological regimes in the copper sector, as well as countrywide aggregate productivity data, which were compared with the trends in key geological features, notably ore grade. As a result, the studies provide interesting insights into the dynamic nature and the interplay of the impacts of depletion and technology, which are sometimes offsetting. Albeit the focus was on the copper industry, the observations lead to a more general understanding of the impacts of various geological changes that follow depletion, especially in the two common characteristics, such as ore grade and ore chemistry. The empirical data across various metallic sectors often show trends that do not entirely support the classical assumptions of sequential depletion and the popular view of the detrimental economic consequences of depletion. The key findings and their geo-technical background will be discussed next without resorting to broad generalizations. Nevertheless, these findings may have relevance for other sectors too. A comparative discussion on the observations from productivity studies conducted herein and that of notable past studies, which were often based on other economic indicators, in particular, price path, is presented thereafter. This last section closes with a set of final thoughts on the future agenda for the industry, based on the present study. The key findings, with respect to the impacts of depletion and technology, and their plausible combined effects on productivity growth, are summarized below. Some of the changes, such as lower grades of copper coming up in significantly larger ore bodies, proved beneficial (Musgrove 1971). It also appears to support Lasky’s postulate that volume of ore increases geometrically with arithmetical decrease in grade (Lasky 1950). The larger deposits facilitated large-scale mechanization with high output and enjoyed better economies of scale, and thus indirectly boosted productivity growth. The energy consumption in the mining stage went down in these deposits, although the energy requirements in beneficiation and refining increased. Grade values of the oxide-based resources of iron and zinc did not show strong signs of decline (Mudd 2009), irrespective of the crustal abundance of the metal.21 Although the sample dataset is rather small to permit comment on generalized pattern amongst metals, it shows that the sulfide-based resources, such as that of copper, had signs of irreversible fall in grade earlier than the oxide-based ones that are said to be larger in volume (Skinner 1976). It is also observed that energy intensity and yield varied inversely in a non-linear manner with grade, with the rate of change rising dramatically when grade went below a threshold value or resource type changed from sulfide to oxide. More importantly, the energy intensity in the three important steps of extraction, varied in different fashion with respect to change in grade. Energy intensity in mining step went down as larger ore bodies with lower grades (in line with Musgrove 1971) permitted the application of economies of scale, while that in beneficiation and refining went up as impurities increased. Such behavior resulted in non-uniform movement in total energy intensity in extraction, rather than a singular trend. In effect, the productivity fell abruptly at this point of shift in resource type, in line with the bi-modal occurrence of copper resources (Skinner 1976), despite a gradual and unexpected improvement until then (in support of Barnett and Morse 1963). A reverse trend, i.e., a fall in cost with depletion, should not be ruled out too. Depletion in copper industry caused the miners to shift to such oxide ores that required higher-energy intensity for extracting metals, as compared with the previous sulfide ores. However, a reverse shift from higher energy-intensive ores to lower-energy-intensive ores may not be ruled out in some metals. Abundant metals such as iron, are presently extracted from oxide ores, while sulfide-based resources, which should require lesser energy-intensity, remain unused. If the industry later switches to the latter variety eventually, energy costs are unlikely to go up. In many cases, industry is not able to access and utilize the lowest-energy-consuming resources first, thus violating the dictum of sequential depletion. According to USGS estimate (Edelstein 2013), large porphyry type deposits having both types of ores, account for 60% of undiscovered copper resources in the world. If subjected to combined regime of exploitation with advantages of scale, these resources may have higher productivity than some of the present ones. In Australian copper industry, energy intensity fell as exploitation shifted from smaller rich deposits to much larger lower grade ore bodies, that enabled large-scale mechanization. Thus, changes in physical and chemical characteristics of ore bodies or ores, need not necessarily translate into a rising cost with depletion in all cases. Mining industry, being a capital and technology intensive sector, draws on the research and development efforts of its equipment suppliers who use their heavy engineering skills and capital (Bartos 2007; Filippou and King 2011). Until 1997, the large mining-equipment-manufacturing firms were mostly based in technologically advanced nations such as the United States, Europe and Japan. However, in 2011, China reached the top position in value terms, followed by the USA, Japan, Germany, Singapore, Italy, Brazil, South Korea, India, and Canada. These manufacturers partnered with mining firms in Asia Pacific, Sub-Saharan Africa, Latin Africa, Australasia, Europe, and North America to develop the machines according to customers’ requirements (Farooki 2012). In the equipment-manufacturing industry, the specialist suppliers who develop machines for context-specific applications require a large set of potential users to share its fixed costs of technology development. Economies of scope, rather than economies of scale determines the growth of this group of specialist suppliers (Kaplan 2012), where collaborative efforts assume high significance. Among the three distinct steps of metal extraction from ores, viz. mining, concentrating, and smelting refining, it was found that the mining activity benefited from general progress that applied to the entire industry while the other two steps benefited more from the sector-specific changes. However, commonalities do exist amongst the technological developments across the sectors (within similar steps of processing), such as similarity in hydrometallurgical extraction techniques in copper and nickel sectors.22 The changes in these three steps appear to be mutually independent. These improvements are mostly incremental and continuous in nature, but examples of discontinuous changes exist, too. SXEW in copper and HPAL in nickel industry are examples of discontinuous technological changes. Other notable discontinuous changes are HiSmelt smelting process, heap leaching, and intense smelting of sulfide concentrates with bulk oxygen (McNulty 1998). It was found that in copper as well as in metallic minerals industry in general, technological change was mostly driven by learning-by-doing or continuous improvements23 with occasional incremental steps, often coming from equipment vendors, in particular from the furnace manufacturers. In this context, the contribution of a significant innovation or step-change technology SXEW, designed specifically to exploit the next available resources of copper, was found to be way less productive than the old pyrometallurgical technology acting on the most preferred resources. Presently, it is found that most of the SXEW installations in the world copper industry are acting as secondary metal recovery units in conjunction with the old pyrometallurgical plants, and rarely as stand-alone units for very low-grade oxide-based ores (ICSG 2015). In case of a similar change in resources in nickel industry, the newly developed process HPAL was later termed as “an expensive failure” (FD Capital 2007). Although the costs of extraction are undeniably rising in the copper and nickel oxide ore extractions as a result of change in resource type, ceteris paribus, it may not be appropriate to generalize on them. In fact, a significant study on Canadian mining industry observed that not all technological change would lead to productivity increase and showed that overall mining TFP growth ran negative from 1973 to 2000 in spite of new technologies being ushered in (Bradley and Sharpe 2009). This study, however, took the entire mining industry as a composite sector without considering the specific metals as separate sectors, which experience different levels of depletion and technological changes. The net effect of the shifts in the resources and technologies will depend on the specific circumstances prevailing in a given metallic sector. Mining companies invest lower in R&D to develop new technology compared with medicine or software giants but focus heavily on exploration activities. In a way, exploration is referred to as the R&D of this industry. High capital expenditure, high risk and scope of widespread diffusion also discourage large investments in R&D. Those large companies who ventured into serious research could seldom reap the gains. These factors apparently contribute to slower innovations. Rather, it is often found that economy of scale is a major technological offset that improves productivity in mines, within its physical limitations. The trend in metal mining industry has been towards fewer, larger and more efficient facilities, which are owned by trans-national companies, bringing in consolidation. It is often pointed out that consolidations and outsourcing may have been responsible for the decline in the research and development spending in the 2000s (Holywell 2005). Though the project failures are sometimes attributed to low metal prices due to competition from developing countries and high operating costs, hasty use of new technology without testing it at the required scale is also a significant factor (Nice 2004; King 2005). These experiences have prompted many mining firms to stay away from large capital investments with high-risk innovations (Filippou and King 2011). Governmental support to mining research has also played a significant role in the industry. Such support has established Australia as a place of choice for industry research, while the lack of it is cited as the reason for the growth of specialist services in South Africa (Kaplan 2012). The extensive networking between firms, including the collaboration with publicly funded research bodies, universities, dedicated exploration companies, high-tech service providers, contractors and others, as seen in the Australian case, has been described as a “dynamic web” (Dodgson and Vandermark 2000). It enabled firms to outsource technology development, to work with public research providers or other companies, and even transfer it from abroad. In Finland too, the government is said to have emphasized on linkages between research organizations, universities, firms, and industries in relation to knowledge production, and worked through public-private partnerships involving economic research organizations, industry federations, and firms (Dahlman et al. 2006). In mineral-to-metal processing stage, incremental improvements and process optimizations are often needed to respond to the specific complexities of a deposit. This requires extensive collaboration of the equipment manufacturer and the user firm to minimize the risk of a costly failure (Tidd et al. 2001). Step-change technologies and non-incremental improvements, however, require newly designed plants and processes, and takes time to develop. These are high-risk and expensive ventures, as projects often have to be abandoned before commercial operation. They are generally found unsuitable for collaborative development and often beyond the reach of smaller companies. They may require strong as well as strategic motivation to succeed (Dry et al. 2002; Upstill and Hall 2006). The impacts of depletion and technological progress on productivity vary continually in course of cumulative exploitation of resources, resulting in periodic ups and downs in productivity growth. The extent of mitigation that technology has achieved so far has varied accordingly. Technology improves productivity by augmenting metal yield as well as by reducing the input intensities, notably that of energy. Technological impacts surpassed the detrimental impacts of depletion within a specific range of transition in ores, for a given type of ore set in a specific technological regime. The indirect positive impacts of some of the geologic traits, for example, larger size of ore bodies have helped too. In the present case of copper, technology has failed so far, to mitigate the sharp and sudden fall in productivity at the transition to the next available ore type. However, it is unequivocally established that thus far technological progress has made it viable to extract metals from increasingly larger portions of the known and accessible resource bases and hence successfully offset physical depletion. Observations from several studies, which analyzed cost and price path of metals, such as copper, for signs of depletion and scarcity, are discussed here. The decline in unit extraction costs of minerals during the 1958–1972 period (Barnett 1979; Johnson et al. 1980) was interpreted as an evidence of “no scarcity,” if not growing abundance. We have shown that in the initial years of the Australian copper industry, productivity growth came from richer finds, while in the later period, technological progress, sometimes aided by certain favorable geological characteristics of resources, contributed to productivity growth. This growth in productivity would lead to fall in costs (and price), ceteris paribus, in line with the findings of past studies. At the same time, improvement in technology often lowers the cut-off grade, leading to an increase in the resource base, and thus reduces scarcity. However, there is no strong evidence to directly link these two separate and mutually independent, albeit often simultaneous, outcomes of technological progress. Disruptive changes, notably discovery of rich resources (for example, Carajas iron ore deposit) and innovation of new techniques (such as “froth flotation” applied in Bingham Canyon mine), were known to have created an aberrant dip in cost, and often led to a decline in price (Herfindahl 1959; De Sa and Marques 1985; Livernois 1987; Swierzbinski and Mendelsohn 1989). The US OTA (1988) study on the impact of SXEW on industry costs supports these observations on technological impact, while the richer finds in initial years of Australian industry contributed to increased productivity, which would have led to lowering of cost. The possibility of such impact from discoveries of low-cost resources as well as technological changes was mentioned in an earlier study (Barnett and Morse 1963). In the past 140 years, the copper and iron ore industries have shown average global labor productivity increases of 3.4 and 2.5% p.a. respectively, which include a significant contribution from the opening of new locations (Humphreys 2001). The observation from the US case study, where energy rise was found to best-fit a second-degree polynomial, supports the earlier hypotheses on expected rise in input intensities with depletion, namely, non-linear rise in energy intensity with fall in grade (Cleveland 1991; Meadows et al. 1993). A sudden and steep rise in costs, consequent to a jump in energy input intensity could not be ruled out either (Lasserre 1985). The continuous interplay of impacts of depletion and those of the subsequently introduced technological changes were cited as one of the reasons behind fluctuating price path in previous studies (Slade 1982; Dasgupta and Heal 1979). The other key reason was demand-supply imbalances (Goeller and Weinberg 1978; Radetzki 1985). In the Australian case study, this “interplay” was found to cause fluctuations in the productivity trends too. This phenomenon rendered the findings of the studies sensitive to the selected time period for analysis, in case of price path (Smith 1978, 1980; Smith and Krutilla 1982). This argument appears to hold good in productivity studies too, as seen in the Australian case. The data from Australian mines reveal that the assumption of sequential depletion of assets did not hold good in the medium term, albeit it appears to fit the longer-term trend (in line with the previous observation of Cairns and Lasserre 1986). This non-sequential pattern of depletion seems to be in line with the findings from the studies conducted over early periods of industrialization, too. The longer-term trend however, does not indicate that cost of production fell due to either random discoveries of easy-to-win rich deposits (Swierzbinski and Mendelsohn 1989) or cost cyclicality26 during progressive exploitation of deposits (Arrow and Chang 1982). The instances of selective mining of high-grade deposits during low-price periods, as mentioned in the cases of the mineral sectors in Australia and Canada (Roberts 2006; Topp et al. 2008; Arsenault and Sharpe 2008), vitiated the efficacy of price as an unambiguous indicator of rising (or falling) scarcity (Reynolds 1999). Such “high-grading” may cause productivity to rise beyond the rational trend during low-price periods.27 In this context, rational trend refers to the secular trend28 arising out of depletion and technology, setting aside the influence of cyclical factors. In a similar fashion, low productivity mines were reported to have come into production during high price periods in Canada (Strollery 1985), thus adversely affecting the aggregate productivity. The influence of these cyclical factors, therefore, needs to be considered carefully and eliminated to the extent plausible, before drawing inferences from the studies on either productivity trend or price path. Disproving the price-rise hypothesis was not found to lead to unambiguous inference on decreasing scarcity29 (Reynolds 1999), and the same is found to hold good for productivity trend too, in the Australian and US case studies where productivity was set to increase with exhaustion, until a threshold grade was reached. Although the case studies did not analyze any metal other than copper in details, the presented data and subsequent observations on various metal sectors lend support to the hypothesis of a previous study (Gordon et al. 1987) that the cost increase (or otherwise) due to ore transitions will depend on the geo-chemical distribution of a given metal, and may vary widely amongst metals, with the likelihood of being the highest in case of scarce ones, and lowest among the oxide-based resources, especially the abundant ones. Scientific isolation of input-output data up to the level of independent sub-processes of production confirms that specific impacts of depletion and technological changes, through energy intensity and metal recovery, are quantifiable and measurable at the integrated unit (plant and mine) level. Such specific differentiation of impacts is not possible from aggregate productivity change registered at either unit level or sector, which would reflect the net changes only. Though several studies in the past have discussed the aggregate changes, the present disaggregation clearly shows the mutual offsetting of the impacts and their respective roles. It also helps understand why and how productivity shifts when the new technology replaces the old one, in lieu of the crucial change in ores. Productivity studies, with suitable adaptations, are useful tools to quantitatively evaluate the efficacy of technological progress within the metallic minerals industry and across various non-extractive and extractive industries. Insights from such studies may provide appropriate guidance towards development of new technologies and investment into new projects, especially when geological characteristics vary significantly. Since ore input characteristics are built into the model through an appropriate proxy, such as grade (purity), productivity studies directly relate to the changes in output and input intensities, due to natural input variations as well as technological changes. This overcomes a crucial shortcoming of other economic indicators and allows for the disaggregation and estimation of the impacts of natural inputs and technological changes, through the “Residual.” When calculated from unit-level technical data, if available, such productivity estimations can be largely free of external influences and reflect the extent of mitigation or otherwise. Although such process data may not be always accessible by outside agencies,30 time-series data on determinants of productivity are presently well documented in most of the mineral-rich nations, such as Australia and Canada (Arsenault and Sharpe 2008), and available in the public domain. As society extracts increasing amount of metals in its relentless pursuit of growth, technologies will have to evolve continually to counter the various types of natural challenges that may come up, in order to maintain the cost competitiveness of the metals vis-à-vis alternative materials. Some of the challenging areas will be economic and optimized extraction of multiple metals from poly-metallic deposits. Study of the relevant geological perspective rather than simple extrapolation of past trends, may best indicate the imminent challenge. Disaggregation of data helps in ascertaining the economic impacts of changes in technology and geological characteristics, by controlling and/or eliminating the concurrent effect of factors unrelated to these changes. The moderate contribution of learning-by-doing and the incremental improvements that have played the largest role in boosting productivity in the past may not suffice to offset the future challenges, especially in certain fast-changing metallic mineral industries. The mining industry may have to invest more in developing step-change technologies, where it has had a poor record of success so far (Bartos 2007), to guard against fall in productivity leading to rising costs. New technologies are focusing on lowering the cost of solid-liquid separation, which is an important component in deciding upon the economic viability of processing. Similarly, the oldest and cleanest metal separation technique of electro-winning is going through various incremental improvements to reduce energy intensity and chance of over-potential,31 as well as increase current density while controlling purity and morphology of depositing phases. Sophisticated on-line sensors are targeting optimization of critical variables in complex hydrometallurgical processes. The mining industry needs to realign itself towards a balanced sustainable path, in terms of extraction methods, effluent disposal, usage of energy and so on, to operate harmoniously with the ecosphere. Improved waste management techniques are being developed to reduce the environmental impact of the effluent discharge of the mineral processing technologies, especially the toxic and hazardous ones, while maintaining economic viability of operations. 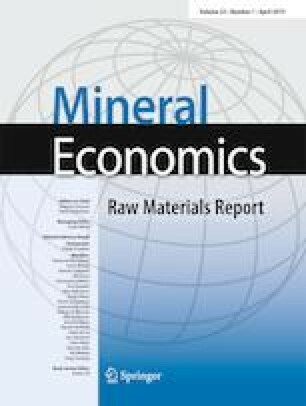 As resources deplete, industry has to focus increasingly on developing new techniques, perhaps in collaboration with other stakeholders and suppliers, so as to economically extract the maximum possible quantum of minerals from existing bases, with minimum disturbance to the environment. Governments too need to step up their involvement in guiding, incentivizing and supporting such efforts, which may involve high capital investment, alignment with the social goals, and carry high risk of failure, too. It is important to mention that Swan (1956) developed a similar model working independently. The concept was earlier discussed in the works of Tinberger (1942). In certain countries, such as Australia, this is referred to as multifactor productivity (MFP). The terms are identical and used synonymously in this text, in the context of different reports from multiple countries. They reported that in Spanish coal mining sector, the Solow Residual showed that Coal mining productivity was significantly impacted by resource depletion, proxied by drop in reserve base (stock). This exercise also showed that depletion caused 1.29% increase in inputs. This study used indices for all parameters instead of actual values. KLEMS comprises the capital-labor-energy-material-services, respectively, used to measure TFP or MFP. Six “abundant” metals constitute almost 99% of earth’s crust, while the rest, including copper, aptly termed “scarce” metals, account for the balancing 1%. The abundant ones mainly occur in oxygen-bonded compounds (such as oxides or silicates), while the primary or most preferred source of scarce ones are often rich sulfides, followed by larger resources of lower grade of oxides. The “threshold,” which will be explained in details in “Analysis of data” later, is somewhat akin to Skinner’s concept of mineralogical barrier (Skinner 1986). Change in chemical composition of copper ore from sulfide to oxide and fall in copper content (grade) of ore.
Old technology refers to the traditional pyro-metallurgical extraction methods, while the new technology denotes the newly developed hydrometallurgical methods of enhanced extraction (SXEW). A 2nd-degree polynomial fitted best into the rising energy curve, as grade declined. In BLS data, E is included in M and the drop in E due to new technologies is partially offset by rise in M in leaching, as acid is added as a new process input material. Till date, hardly any copper project is found to come up in purely new regime and the only usage of SXEW is limited to combined regime in certain plants. This is available in current data book from the website of International Copper Study Group (ICSG 2015). The other type of deposits, termed “strata bound” does not have the benefit of co-occurring sulfide and oxide ores in the same orebody. Economic demonstrated resources, a geological term, roughly corresponds to proven (P1) plus probable (P2) categories as reserves and exclude the “inferred” category of resources. The term “geological domain” is used here, instead of limiting ourselves to geographical boundaries of any country. Within a “domain,” there will be reasonable uniformity in geologic characteristics. It was noted in the USA case study that the intensity of key inputs, notably energy, increases rapidly in non-linear fashion when grade falls below a threshold value. In Australian situation, grade values remained higher than such threshold and therefore the non-linearity is insignificant. This is noted from data segregation and analysis from Mudd (2009) report in course of this study. The best orebodies or the best sections of an orebody may not always be known or accessible in the descending order of purity. Richer grades often naturally occur at depths or at interior parts of the orebody, and thus are accessible only after the inferior portions are excavated. Examples of richer finds, long after mining has begun in a country, are also many. Crustal abundance refers to the cumulative volume of a given metal present in the crust, and not to the richness or otherwise of the individual ore deposits of the metal. However, more often than not abundant metals are found to occur in richer deposits (higher grades) than those of scarce metals (Skinner 1976). For metals extracted from poly-metallic ore deposits, such as zinc in silver–lead–zinc combination, the technological processes are developed to suit the specific challenges. Previous studies had pointed towards this trend in the minerals industries (Humphreys 2001; Upstill and Hall 2006; Bartos 2007). This constitutes a reference to the range of grade values, techno-economic threshold grade, type or ore and switch in chemistry from sulfides to oxides, change in physical conditions, and so on. While ore grade is a popular proxy for depletion effects, cumulative extraction volume of production is also taken in certain cases (Rodriguez and Arias 2008). This refers to the variation is extraction cost as a mine progresses through the various parts of a deposit, where “difficulty” levels may vary and impact input intensities accordingly. By selectively extracting higher grade sections of orebody with the same amount of “effort” as required for extracting a lower-grade section, the miner tends to maximize metal unit output in a given period and defer the extraction of the lower grade areas. One dictated by sequential extraction. One cannot deduce that scarcity of a metal has gone down, purely because price or cost of production has not risen over a given period. In a large uniform mass of ore deposit, cost of production is unlikely to rise, while the orebody may get eventually exhausted. OTA, being a government-backed entity, had access to the cost and technical data of the individual business units in copper industry. Researchers and private entities may not have such access at all. This implies excess electrical charge, which leads to wastage of energy.